Hyland’s Homeopathic Teething Tablets are ranked number one in Google when you search on “Teething Tablets”. I get really excited when I see this and the parents’ testimonials of praise and thanks as this promotes the natural curative art and science I so love. I would like to have a chat about Hyland’s Teething Tablets this month and tell you why the ingredients actually work. I will also start by telling you why a babe might suffer teething issues in the first place. Teeth are no different from bones or the formation of the head and skull. If a person is struggling with symptoms with their teeth, we can generally find issues also in the muscleo-skeletal system in general. Unlike the allopathic model of patient treatment, we wholistic Heilkunst practitioners don’t divide the body up into unrelated parts and then try to treat them in isolation. This makes no logical sense. Like the old song, the shin bone is connected to the knee bone, our bodies don’t do much in isolation of itself. So if a babe is struggling with building teeth, we want to know why and how this phenomena relates on other levels of their whole being. Rudolf Steiner, spiritual scientist, says that teeth formation can not occur without Magnesia Phosphorica, Calcera Florica, Calcera Phosphorica and Calcera Sulphurica, Natrum Muriaticum, Silicea, Lime, and Calcera Carbonica. Essentially teeth and bones are just a structured repository of salt and mineral deposits based on a divine blueprint. So if there is a shortage, we want to know why and then what to do about it. Right? Teething can be a struggle if not enough minerals are available for the purpose of construction. Its a little like not having enough bricks delivered to the work-site to complete a house. A babe with a Homeopathic Constitution such as Calcerea Carbonica or Silicea can have a tough time with dentition as they need more Calc. and Silicea available to them as building blocks. Shocks and traumas in utero, at birth or even the vaccines can stunt growth and the capacity for easy dentition as the life force cycles, dedicated to patterns of disease as opposed to growth. 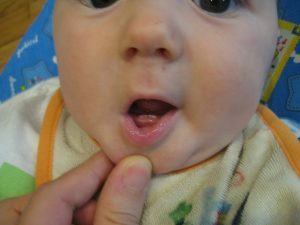 A genetic predisposition to Syphilis can compromise an infant’s capacity for easy dentition and bone development with caries, facial deformations, and loose teeth that crack or up-root easily. Some babes will cut teeth without an ounce of drooling or complaint, while a sibling can suffer sleepless nights, inflamed gums and enough soaked bibs, so wet they can be wrung out at the end of the day. This was true about my own children. My son Jordan was born two month’s premature and didn’t cut his first tooth until after his first year. It was excruciating for him and each tooth brought a another ear-ache, antibiotics, and 2 winters with pneumonia. It was a vicious cycle and one we were very happy to break it outright with Heilkunst medicine. You can read about it in my book, The Path to Cure: The Whole Art of Healing. Please feel free to contact us if things don’t resolve easily for your babe. The genetic miasm Syphillis can be a nasty piece of work with regards to dentition and we love the opportunity to address this for you and your teething babe. My son is a Calc. Carb and according to the laws outlined in this blog… he would be one of the more difficult constitutions for managing the discomfort of teething. About a month before he started to teeth (4 months), I started giving him 12 in 1 Tissue Salts (much the same as the Teething Tablets described) in his bottle three times per day (on recommendation by Arcanum). We were SO fortunate to not have had any difficulties with his teething. No sleepless nights; minimal crankiness; no fevers; and no outrageous amounts of drooling. I would highly, HIGHLY recommend the use of Scheussler’s tissue salts and they can be purchased at most natural health food stores. Awesome, Susan, that is great to hear and we thank you for taking the time to comment on this article and offer up your experience with the tissue salts and your beautiful Calc. Carb. son.